I've used my Oculus CV1 since release with no problems. I got the touch controllers yesterday and was enjoying them last night. Today the hdmi isn't detecting. Only thing I did was download a VPN client, not a clue what the issue can be. Of course I turned everything off and back on, disconnected and reconnected. Audio is coming out of the Oculus, but no video. All devices are connected, HDMI has a red triangle next to it saying "Error." I click the Rift square and hover of the '?' next to the error icon, it says "No HDMI cable connected." That error can also happen if there is a USB issue. Try another USB port for Rift (USB 2.0 can work as well). You can also try updating USB drivers for your motherboard. When I plug the USB in the Rift device pops up and shows not being connected. When I unplug the USB the Rift device disappears, it looks like the USB is working properly. I tried another USB port and the same thing happen. Your VPN could be blocking Facebook/Oculus servers, and that would cause the software not to work. Can you try on your direct connection (not VPN) and also try disabling anti-virus/firewall software? I did as you said and the same issue. I changed "Debug HMD Type" to 'CV1' from 'Disabled.' The HDMI was then detected on the Rift headset, but the two sensors say "Poor quality" and setup won't work. I change 'CV1' from debug back to 'Disabled' and the initial issue happens. I can keep the Debug HMD Type to CV1 and skip setup when it says the sensors fail, then in the devices screen the sensor says with the red error triangle, "Poor Tracking Quality," then when I hover over the '?' it says "RepeatedCatastrophicFailure"
Don't mess with the debug tool options unless you are a developer. That debug HMD type is an advanced feature to allow developers to test code, it won't allow you to play games. Please make sure debug HMD type is disabled. This sounds very much like a USB hardware or driver issue. Try updating USB drivers on your motherboard or uninstalling USB drivers (in Device Manager) and using Microsoft default. I'd also recommend getting this add-on card (it has to be this exact one). My main confusion is why this has worked for more than a year now, then I use the hand controllers once and the next day it stops working. I can't purchase what you're suggesting, I'm using an Alienware laptop that's using the Graphics Amplifier attachment in order to use a Ti 980. First I'll try removing the additional sensor and see if I can get the Rift to work in the old setup, if that doesn't work I'll try the USB drivers update and report back. 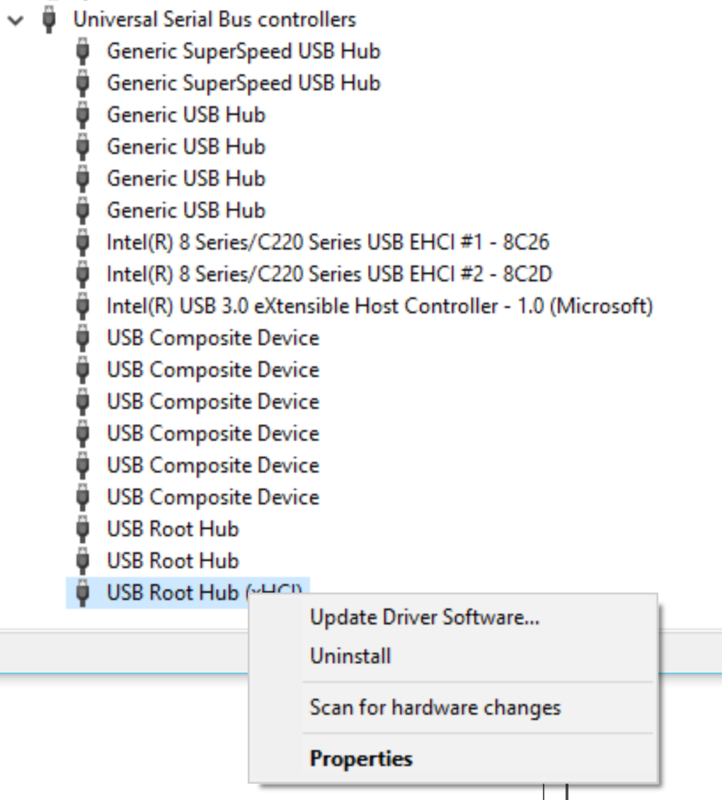 Windows has a tendency to update drivers in the background without any prompts, so it's possible you have an incorrect USB driver installed without your knowledge. I've seen that happen before. The other possibility is the the headset or cable has become non-functional, and it was just a coincidence you recently got the controllers. In any case, you may wish to submit a support ticket. It didn't work to remove one sensor. I updated all the drivers and restarted. Then I scanned the USB drivers for changes. None of that worked so I went to the USB devices and went to uninstall the drivers, but there are a ton and I'm not sure which to do, don't want to do them all and not be able to update them for some reason. If you can either tell me which ones to uninstall or reassure me doing it to them all will be no issue, that'd be great. Hmm.. I'm not sure which one it is exactly. Also, it's very possible the hardware has just become non-functional. Might be best to submit a support ticket. If it is the hardware, you may be eligible for replacement. Thanks. You and I are having the exact same issue SirJungle, I just started having problems less than 24 hours ago with my computer not detecting the hdmi. Thanks for the help, just submitted a ticket. Well you're in a bit better place than I am, I can't get anything to show up on the Rift. I suggest creating a new discussion thread to try and troubleshoot the issue. I've received support and submitted a ticket to receive a replacement cable within 4 hours, they're quick. Run an Intel Existential usb 3.0 update - find out the MOBO provider and get the ones from there - or check your chip Gen and install that. I'm unfamiliar with an Intel Existential usb 3.0 update, but my MOBO provider is Alienware as I'm working from an Alienware 15 laptop. I did the full Alienware drivers update, did that cover this type of update you're referring?